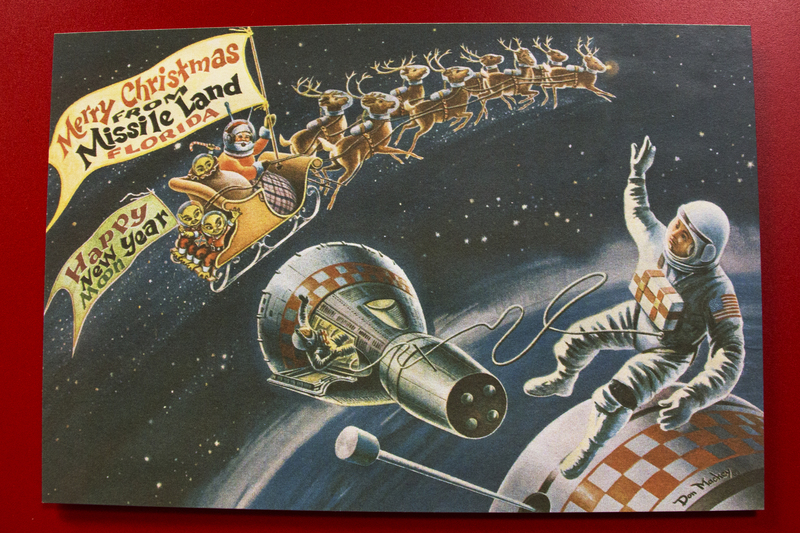 Card #1 Missile Land Florida by Don Mackey features Santa on a sleigh pulled by eight reindeer (including Rudolph). The reindeer are wearing space helmets and have air canisters on their backs. There is an alien in Santa’s sack, and two more aliens on the back of the sleigh. Banners say “Merry Christmas from Missile Land Florida” and “Happy New Year Moon”. Two astronauts are waving from orbit. On display at Christmas at the Air Force Space and Missile Museum, Cape Canaveral Air Force Station, Florida.